Comment: A perfect yellow (like GYC251) with no green, brown, grey, nor colour shift. Other than GYC251 the cut is perfectly oval and gives the gem an even better, near 100%, brilliancy (which is rare in ovals). Though the inclusions like to show in our unforgiving images, the eye needs a lens to find a set of comet-like inclusions. 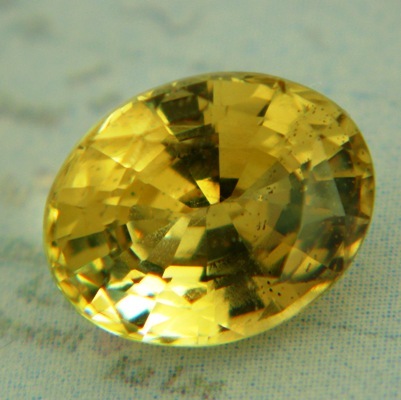 Best type of yellow gem besides sapphire, which is, untreated, rare in this colour. 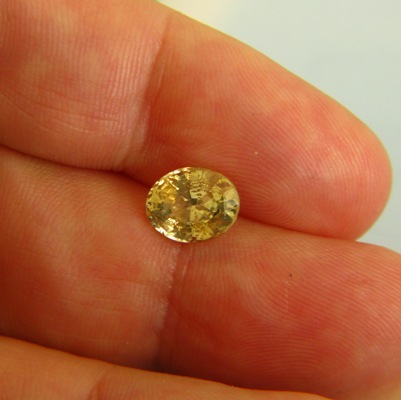 Chrysoberyl is equally durable as our sapphires and also untreated. Shiny gem with fine crystal. Full GIA report. Images were taken away from sunlight because its shininess was too strong and the camera showed a bluish blur (the same effect unheated gueda sapphire from Ceylon shows under the camera, it must a similar chemical composition).